“After silence, which is the most incomprehensible, comes music” – Aldous Huxley. The meeting of Healing Touch and music brings together two of the most ancient healing arts for the benefit of humanity. Music, according to ancient people, was not a science or an art but the first language where the messages present in nature, like the movement of air, water and fire are expressed in the vibration of sound. Life expresses itself as music. Life is vibration, death is stillness and silence. Music has always existed in the universe. We continually tap into it as our consciousness evolves, translating it to a new musical understanding as we recognize its value. It has shown itself through artists, healers, and visionaries. Music precedes all other formation and intuitive cognition. It comes as an expression directly connected to a human, inner-heart knowing. This heart knowing comes down from the spiritual realm to those who have developed inner hearing and are capable of translating it to audible, earthly sounds – that we know as music. Welcome to the March 2008 issue of Energy Magazine! Shift and change seem to be the keynotes of both my personal life and with Healing Touch Program in the last few months. Personal meditations as well as billboards on the highway and other “messages” about change remind me that it is not something to fear, but to embrace and learn to flow with. I think back to all the changes I have experienced in over half a century and I remember that not only did I survive them, but their lessons have provided me with invaluable knowledge, new wisdom, developed skills, profound questions, a more compassionate heart, a welcomed sense of humor and deeper faith. We all have a story to tell. It is my hope that by briefly sharing the story of my journey with Healing Touch, you will be inspired to embrace and nurture your own story. I am very blessed that the true purpose for my life is to spread “Healing Light Worldwide”. Professionally, my full-time position at St. Joseph’s Hospital in Tampa, Florida, is now as a Healing Touch Practitioner and educator, with the official title of Healing Touch Coordinator. My workdays are spent providing healing touch treatments to inpatients, in addition to educating patients and their family members, medical staff, non-clinical ancillary staff and community members regarding Healing Touch and it’s use in our daily personal and professional lives. An equal blessing is that I am gifted to be able to accomplish this in an acute care clinical setting, where I can educate and communicate with physicians and other healthcare providers, while remaining informed of current medical trends and practices. An article was published in “The Tampa Bay Metro” entitled “Quality Care, Tampa Bay’s Medical breakthroughs and Advancements.” It depicted many local healthcare facilities and their technological advancements and contributions to healthcare in the area. I am very happy to report the article included a full-page story about our Healing Touch program. Originally published in Energy Magazine: The official Publication of the Healing Touch Program June 2006 Issue. 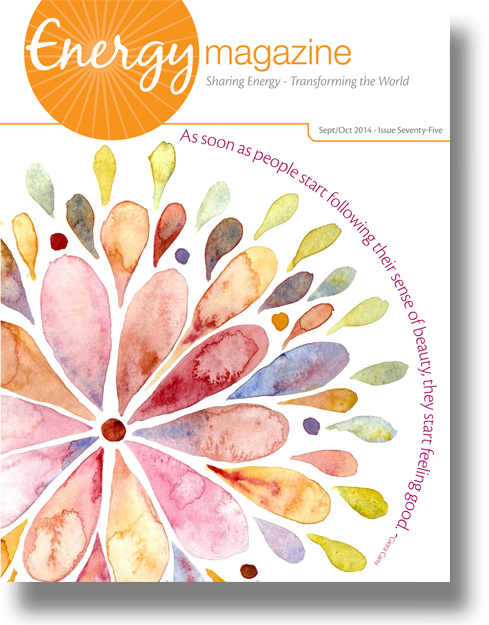 Welcome to Energy Magazine! I am so happy to be part of this inaugural issue! This new endeavor represents another stride in the growth of energy medicine in general, and specifically for the Healing Touch Program.